In just over one and a half years of streaming on Twitch, I’ve gained nearly 20,000 followers (Which you can check here on my channel). I wanted to outline what I believe are the most important things you should be doing to maximize your potential when you start streaming on Twitch. Getting people to your stream is hard enough, keeping them there is even harder. 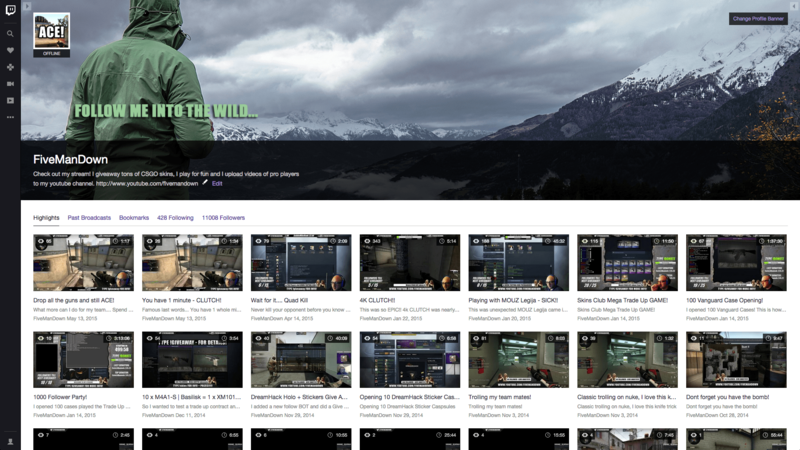 I have spent many hours reading and learning about streaming and the Twitch platform. I have also learned from personal experiences and the experience of others. I run followtrain.tv and I run a Twitch community where we discuss Twitch related topics. It would be fair to say I know a thing or two about streaming. 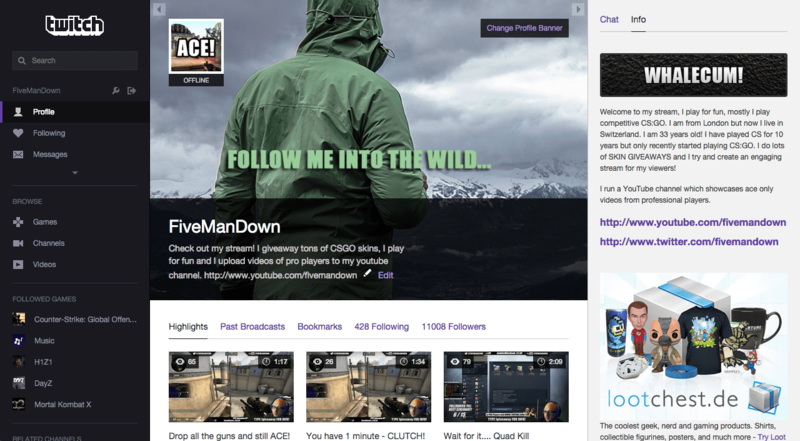 Here are 7 things to keep in mind when you are just start streaming on Twitch. You don’t need to run out and buy a dedicated T1 line when you start streaming on Twitch, but you definitely need to have a decent cable broadband or fibre optic connection. The number one thing you need to do is be able to stream and with a bad internet connection you will end up with a totally black screen or a laggy viewing experience. I already outlined in another post what the best settings to use when streaming, so make sure you check that out. People visit Twitch to watch and listen to people playing games. 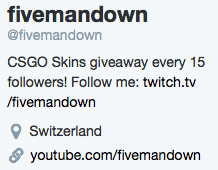 If your commentary is inaudible due to a low-quality microphone, you won’t get many followers or viewers. You don’t need a recording studio quality mic but you do need to be sure that your voice is clear and louder than your music or in-game sound, with little to no static or hum. Try and get a microphone with built in noise reduction in case something is going on behind you, perhaps you live near a busy road and the windows are open because of the heat outside. These small sounds will be heard on your stream as just background noise which can really irritate people. I keep an updated list of what I consider to be the Best Hardware for Twitch. Your channel and brand is important for people to remember you, starting at just $5 you can get custom graphic design service. You will create your HUD (Heads up Display) in your streaming software, something like OBS or xSplit. Personally, I do mine with OBS. 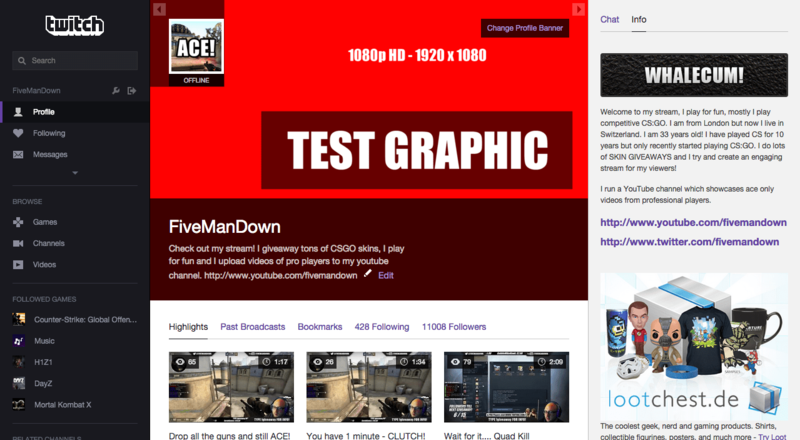 The idea is to make sure that your stream looks good and is viewer friendly. There are a ton of streamers out there, so the viewer experience is going to be what sets you apart. For example you could create a border around your webcam that tells something about your personality or your favorite game. It is also important that pop up notifications give praise where it is due. When someone gives you a donation or follows you you should have a pop up or something cool happening. When viewers see a celebration over even the smallest of donations, they are more likely to donate a few dollars as well. Make an even bigger celebration for your top donors. Remember, people are throwing money at you for doing something you would probably be doing anyway, so make sure they know how grateful you are. Okay, so maybe Lirik doesn’t use a webcam… but you are not Lirik and you didn’t start streaming nearly five years ago when he did. Do yourself a favour and buy a decent webcam. There are plenty of streamers who don’t use a webcam, this is true, they also they don’t have many followers or viewers. If you want to be one of them random unknown faces then be my guest but it wont help you grow on Twitch. People like to see faces, even if you think you are the ugliest person on earth I promise you beauty is in the eye of the beholder. It’s just nice to have a face to go with the voice and the username, so don’t be shy. I was simply amazed how much people did not troll me when I first used a webcam. Most people are genuinely friendly. We all got bullied a little school for one thing or another and that fear is still with us but in my experience on Twitch it’s not an issue. Really you should try it once or twice and I promise you wont regret it, in fact you will enjoy streaming even more. Yes it feels awkward at first and maybe you need to get comfortable with speaking before turning on the camera but sooner or later you need a webcam. You want to be able to stream and record in high definition a 720p camera is the minimum, but a 1080p is always preferred. Many viewers, when looking for a new channel to watch, won’t even click on one unless they see a picture-in-picture cam. Read more about what I think is the best webcam for Twitch. There is only so much that hardware and software can do for you, and there are a ton of great players out there. After that, your persona has to carry you. You will truly begin to stand apart from the crowd and gain a following when people see your personality, and that means interacting. Gaining followers and regular viewers is really about being entertaining. Once you have hundreds or thousands of followers, you may not be able to greet everyone by name, but at least when you are starting out, don’t let people slip in and out of your channel without even being acknowledged. Say something like, “Hi [username], welcome to the stream!” Try to answer questions that viewers ask, and even ask some of your own and check out the responses. Yes, you need to pay attention to the game too, but the game isn’t following you or making donations, so put your viewers first. Don’t argue in the chat box. If someone is really being obnoxious, mute them quickly and move on. Do not waste time or energy with trolls, insta-ban them and forget about it, they will move on to someone else who will entertain their trolling efforts. I’m not talking about view bots—those are a good way to get your channel banned. If you are a regular Twitch viewer, you probably already know what a chat bot is. Chat bots basically serve one purpose—they keep the chat box safe for you and your followers and provide additional interaction functionality. They can ban people for saying certain words, they can tell users what music you are currently playing and they can even help you run giveaways and answer common questions for you. You can also give certain moderators the ability to add commands to some bots to further reduce the amount of work you have to do when streaming. My personal favorite is DeepBot. DeepBot is not free and can be overwhelming at first, start with something like Moobot or Nightbot and consider DeepBot later on. When you first start streaming on Twitch, setting up a schedule for streaming is in my opinion the single most important thing you can do if you want to build regular viewers. How do you expect to get regular viewers if you cant even be regular yourself? Being consistent allows you to get repeat viewers rather than just competing for whoever happens to be on when you decide to stream. Don’t give up if your stream doesn’t take off straight away. Sometimes it takes a while for people to get to know you and decide that your channel is more fun or exciting than the other channels that are currently open. Keep learning and striving to become a better streamer, watch other peoples streams and figure out why they have so many viewers. What are they doing differently and ask yourself how can you be more like them? In my personal experience, last year when I had a three day a week schedule, I was able to build my viewers up to an average of around 70-80 people per stream. I took six months off in the Autumn of 2015 and when I returned I struggled to get just 10 viewers. At the time of writing this article I am now back averaging 30 viewers per stream but I only commit to one day per week, with an occasional impromptu stream on other days depending what is going on in my real life. Sure, things can go wrong when you first start streaming on Twitch. Your Internet or power may go out during a stream. Someone could be trolling chat looking to pick a fight or harass other users. Hardware fails and software breaks, life issues and unexpected social happenings like friends and family turning up at your house. All of these things can effect your stream and your passion for streaming but don’t let setbacks get you down. The most successful channels are the ones that deal with all that adversity but continue pushing forward and making their followers glad to be there. Hard work, research and commitment is what makes a top streamer. I hope you take the time to read more of my articles on this blog and I hope you can gain some insight into streaming on Twitch. I spend a lot of time helping new streamers and I can show you how to get more followers, but it takes some hard work. Please leave me a comment if you have any questions or topics you would like to know more about and I will reply or blog about it in the future. I noticed I was getting lag spikes in game after starting to stream with OBS. It was not because of my internet speed but because my CPU was using 100% of it’s processing power and killing my mad skills in CSGO. This was causing me to have some pretty horrible issues when streaming and playing games on Twitch. How to fix CPU related issues when streaming and playing games? The information in this post will apply to all games not just Counter-Strike Global Offensive so if you have a CPU streaming issue please read on. I didn’t stream on Twitch much since the summer. Mostly because of other projects and because I started hitting the gym a few times a week! I formatted my PC and put Windows 10 on it plus bought myself a brand new BenQ XL2430T 144Hz monitor and I had taken my green screen down to have a huge sort out in the room I use to stream. All of these things combined meant I had destroyed my streaming setup! Putting things back together takes time but I started to do that this week. So previously I guess I had tweaked my CSGO game and my streaming settings, something I must of totally forgot about. I tried to stream the other day and my CPU was running at 100% and causing CSGO to stutter which made me play really badly. I had to make a some tweaks again and now my CPU is running at around 90% which is perfect in my opinion because I have almost maximum performance from my PC and no issues while streaming and playing games. If you understand a few simple ideas then you will be able to make choices that work for you rather than just plain copying me. We all have different gaming rigs and stream different styles of games so the fixes are down to you to makes choices. When you stream your capture software usually XSplit or OBS is recording your screen at the number of frames you specify, then it is resizing the dimensions of the capture as you specify and then it tries to compress it to the size rate which you specify (1800 KB/s in my case) then it sends it down the wire to Twitch. So the more frames you have and the larger your screen resolution the larger the amount of data your CPU has to crush in order to meet your specified streaming KB/s. On top of that CSGO is known to be a very CPU expensive game, the source engine that runs Counter-Strike uses the CPU more so than other games. 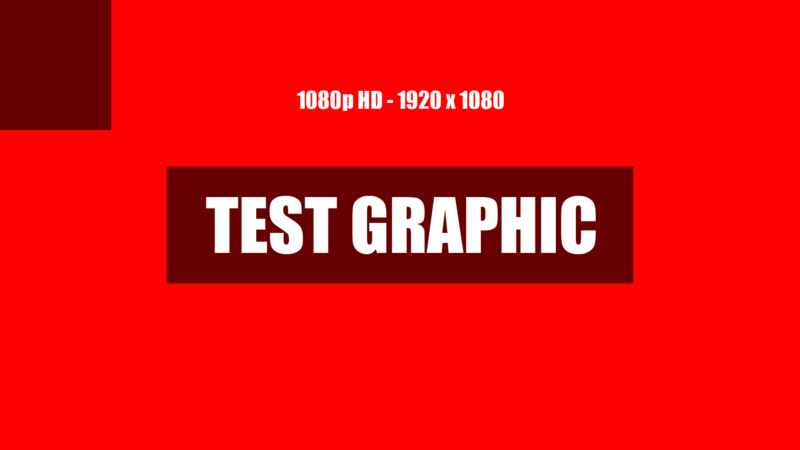 Newer games pass much more of the graphic processing work to the GPU. So in my case both CSGO and OBS are using my CPU. You can check this by going into Task Manager, on Windows by pressing CTRL+ALT+DEL. Analyse CPU issues when streaming and playing games on Twitch! You have to make some choices as to what works best for the style of games yo pay and what software and hardware you use. I outline 5 fixes below. You may have to use all 5 of them. Press CTRL+ALT+DEL and go in to Task Manager. The first unexpected thing I noticed in Task Manager was a little program called “RzStats.Manager.exe” I saw that is was using between 10-12% of my CPU when I moved my mouse. This is because I have a Razer DeathAdder 2013 gaming mouse and when I installed the Razor Synapse 3.0 software it asked me if I would like to turn on statistic tracking for my mouse. At the time this seemed like a great idea. I soon realised that all it really does it create a heat map which is in my opinion completely useless. I disabled statistics tracking in the Razor Synapse software and then the CPU usage disappeared and I gained an extra 10% free processing power. Analyse what is going on under the hood of your machine using Task Manager and work out what programs are hogging CPU and decide if you need them or not. In my case CSGO is using my CPU. I like to have all my graphics settings on maximum and I still get over 150 FPS. Reducing the screen resolution of CSGO can give you more CPU if you combine that with lower graphics settings you can free up a lot of CPU power. I play 1080p and I prefer gaming in full quality so I won’t be reducing my settings in CSGO. This is my personal choice. Adjusting the game quality settings and resolution of your game can sometimes free up CPU power, especially if your game is known for hogging CPU. Reduce the the number of frames per second that you record in. This is what I mentioned earlier. If you are capturing in 60 FPS you are capturing twice as much data as someone who is streaming at 30 FPS and you may have to reduce this. If you are streaming a game like Hearthstone you can probably go as low as 24 FPS without much visual concern. CSGO is a fast paced FPS and I choose to stream at 60 FPS. I can’t sacrifice this. The lower the frame rate you stream the less CPU will be needed. Downscale effectively throws away some of the data so the CPU handles less data. The less data being used the less work it does. 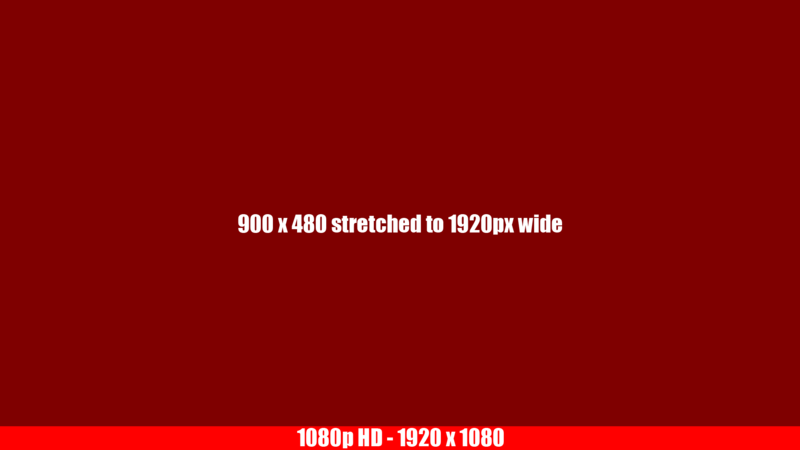 I record my screen at 1080p and I downscale to 720p. 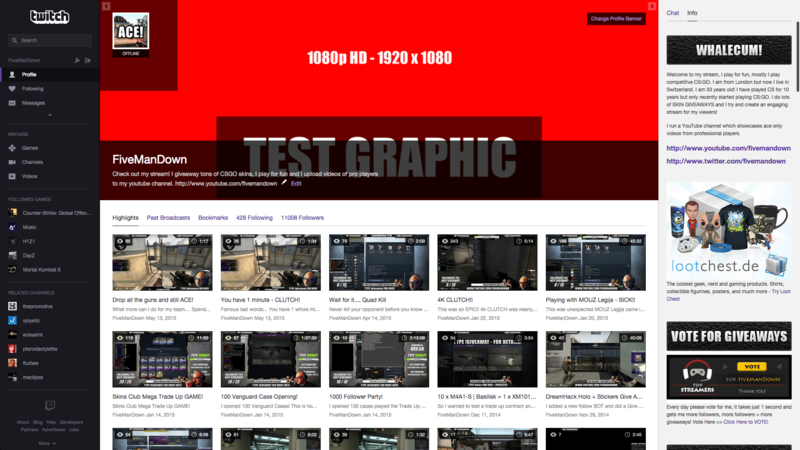 I don’t believe many of my viewers watch my stream at full screen and even if they do 720p is still classed as HD. The more you downscale the less CPU you will use. Fix 5: Spend some money!! If all else fails go and spend some money on some new kit! Yes I want to upgrade, I consider my setup a little old now because I have to make sacrifices to stream! I am waiting for the release of the Oculus Rift before I do any thing major with my rig. I want to be an early adapter of the VR technology that is coming and I want to stream that sh*t! Yeaaahh Buddddyy! Please look at my gaming rig spec above and if your machine is a lower spec than mine then you are probably going to have to make even more compromises than I did. if compromising is not something you want to do then you will have to simply go and spend some money on buying some better streaming kit. I left my CSGO settings on maximum plus I really want to stream at 60 FPS. My compromise comes with fix number 4, I downscale to 720p and this was enough to keep my CPU usage in check. There are some other smaller optimisations that you can make but I haven’t mentioned them because if you can’t fix your issues using fix 1, 2, 3 or 4 then I suggested you go straight to option number 5. If you are reading this article you already know the pains of betting on CSGO! Every time there is a major event you cannot for love nor money get your bets placed in time, you later find out you would have been in the money and you’re super frustrated! I Hope the video makes sense, please leave me a comment if you are stuck. Placing bets on CSGO Lounge during busy times is a pain and for some people it’s basically impossible. Use this super simple method to get those broken csgolounge bots to accept your trades!